There is a small feature that is just wasting little seconds that add up! I started using Visual Studio 2008 and started to notice it as soon as I started making new projects. So, what is my problem, well I will tell you. 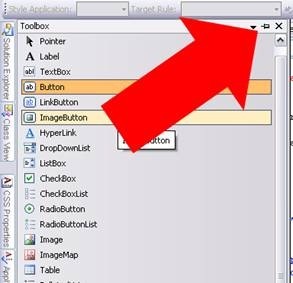 The windows in my Visual Studio keep closing when ‘the pin is not pushed’. Let’s say I want to put a bunch of new controls onto the ‘deck’ from the toolbox. I have to first ‘push the pin’ and then start moving them over to the deck. I can’t just keep the ‘pin un-pushed’ and drag over the items. It should at least stay open for a second or two, and if it gets a user action to grab another item or at least put the mouse inside the window it shouldn’t move away so fast. I have even tried grabbing really fast when the window closes and I can barely even get my mouse inside the window before it closes. I know it sounds like it was built for the keyboard operator more, but sometimes I get controlling and want to use my mouse. One more problem with the windows, if you open a CSS file via the Solution Explorer, the window stays open for eternity. I often find my self having to Alt + Tab or open another window before it closes. This is a design flaw that I have had to deal with for a little while. Since you have some sway at Microsoft, can you please put this on a future release or even something in the options that you can set? I would love to have the option to either close quickly or close after 2 seconds so it lets the user open multiple items in the window. Please help. How about releasing a quick fix? That would be awesome! One more reason why GoDaddy is Awesome! Today, I have a problem with my "Quotes of the Day" Widget by nyveldt. I received an error today with my BlogEngine.Net blog. I was at work and couldn’t get home to fix it and I didn’t want to lose my user base. So I went into GoDaddy and clicked on the File Manager tab. I then tried to download the Web.config file from GoDaddy which didn't seem to work. I then checked mark the file and clicked Edit. GoDaddy actually pulled up the source code of the file. WOW! I was impressed. I changed the Debug Errors to Off so I can view the problem at work. I then went to the XML file it have a problem with and again, clicked edit and it opened the file right up. I changed the problems and it fixed right away. Wow. I was impressed that I could edit the files right on GoDaddy. That is one more reason I love GoDaddy. Thanks to the GoDaddy developers, I got my page right back up and running. I was reading along blog posts and saw a reminder at the bottom of the post to sign up to the RSS. I debated with my self for a few seconds and decided against it because its just some ploy to get you to sign up. Heh. So I created my own ploy. I created an extension that sits at the bottom of every post and reminds the user with the text you prescribe and the RSS link you prescribe. It was something small that only took like an hour, but I think it will be a good constant reminder to readers that they can and should (hehe) sign up to the blog because they enjoyed your post. Basically, you just drop it into the folder BlogEngine/App_Code/Extensions. It is a nice little feature that you can see, I have already installed. I currently have one glitch in the code that I can't figure out. If you use another theme except for mine, you will end up with a space after the link for the RSS. Why, well I have deduced that it is the little picture that sits next to links that shows it will open in a new window. For some reason though, the picture doesn't actually show up. Hmm. So if you can fix this glitch, I will give you credit both in the Extension and this Blog. 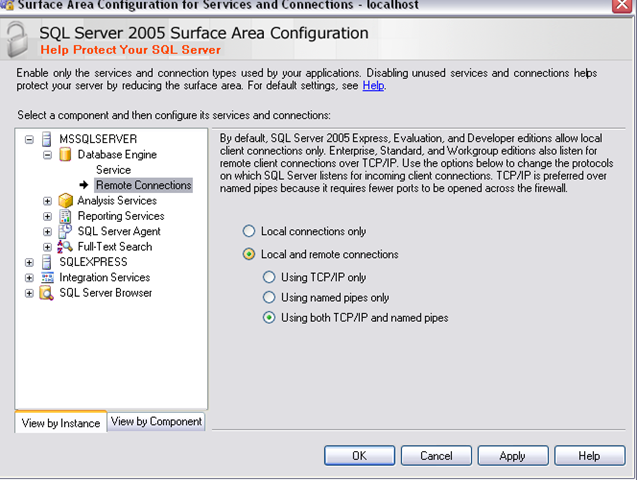 Building a Linq Query gives me a question. So here I am building a new site that will estimate around 500,000 page views and 50,000 database transactions DAILY. I am currently working on a simple query that selects ONE row[column] from a database and returns the value to the rest of the methods. I have a simple thought or question I would like answered and thought this would be a place to bring it up. Is the foreach loop required even if I know I will receive only 1 record back from the database? I think it is kind of pointless to create a foreach loop and use 3 lines of code to just get an ID out of the database. So let me know in the comments section if this is the only answer and I will point out the answer and give you a link back to a site of your choice. Quick Post on problems I am having. So, I am creating a web application over at www.utopiapimp.com , and I am completely renovating the app and converting it from PHP to ASP.net. Its a huge job but I decided to take it up. Thought it would be fun. heh. I found a workaround and wanted to post it really quick. Step 1 - You gotta produce the error! 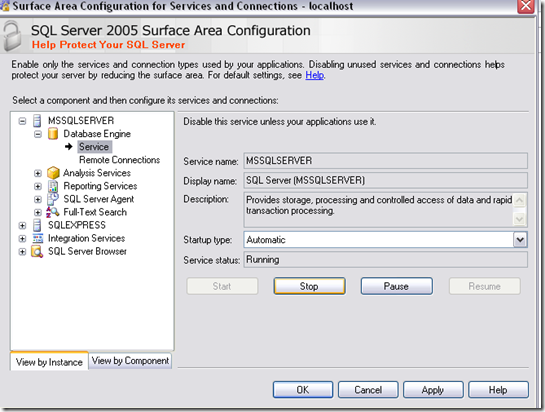 Step 2 - Go to Start -> Microsoft SQL Server 2005 -> Configuration Tools -> SQL Server Surface Area Configuration. 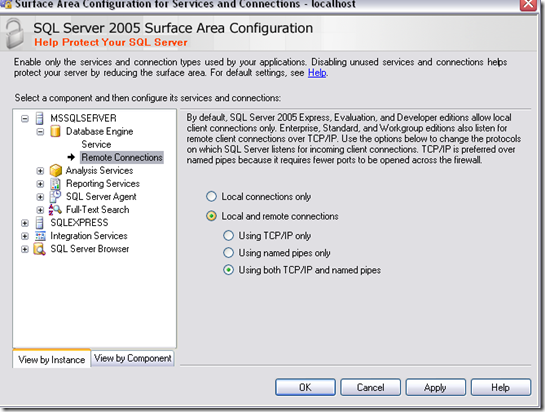 Step 4 - Click on Local and Remote Connections. Allows the testing group to connect. 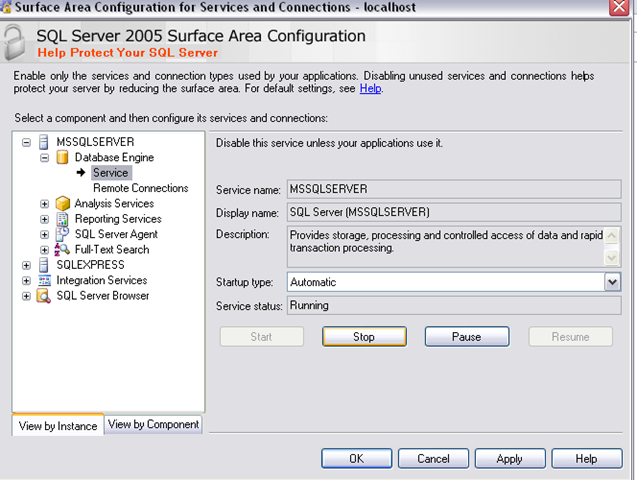 Step 5 - Now, you have to stop and start SQL Server for the changes to take affect, so go back to Service Tab and press Stop and then Start.